Bird feeder hangers that last! This is a Grey Bunny extended reach deck hook. This hook is designed to be mounted on a deck, fence, small wall, or other space where it is possible for the hook to grab it self with a clamp. This deck hook is a best seller on Amazon, and that “hooked” my attention, so I decided to make a review of this product. The first thing that I noticed is the simple way this bird feeder hanger is designed. The hook comes with two very easy adjustable screws that you can turn to mount it on your desired spot. This great hook can be used for hanging bird feeders, bird houses, plants, decorations and lights. It is perfect for bird feeders, but can be used for almost anything. You can easily remove the bird feeder and hang holiday decorations or lanterns if you desire. 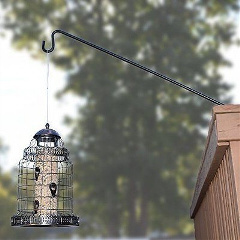 The hook extends and allows you to hang you feeder on a distance so the bird droppings falls away and you don’t have to clean the seed from your deck all the time. When you need to refill the bird feeder it is easy to turn the hook around. 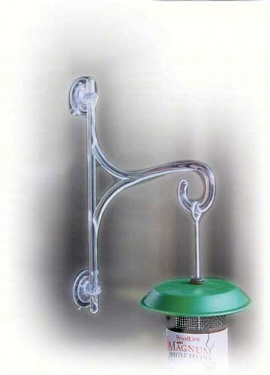 The bird feeder hanger comes with an adjustable base that will mount on up to 2 inches thick railings. No tools are necessary for installation. It is made of heavy duty steel, and will hold the heaviest feeders or planters. The great thing about it is that you have a guarantee for life. That’s a great thing to know. Check the price here Extended Reach Deck Hook, 37 Inch. This is a nice, one in all feeding station kit. It is basically a pole that comes with all you need to have if you want to attract birds. This bird feeding kit comes with three 10-inch bird feeder hooks, that can hold variety of different seed and attract lots of birds to your back yard. It comes with one suet basket, and one water holder, If you want you can remove the water and fill it with seed or worms to attract birds that eat them like blue birds. I recommend to leave the water bath on so birds can have a fresh water source. All accessories can be removed and positioned differently if you desire. You have three feeding hooks for different feeders, and one suet hook, and it will attract large variety of birds. For the price that is excellent! This kit can be installed easy in the ground where ever you want. Just stake the pointed end in the ground in a stable way. There is an h shaped metal at the bottom that you step on when you want to get the pole in the ground. You can buy a squirrel baffle as add on. Check the price here Wild Bird Feeding Station Kit. This is a very simple metal hook that does the job just great. It is not expensive and will work for most bird feeders. 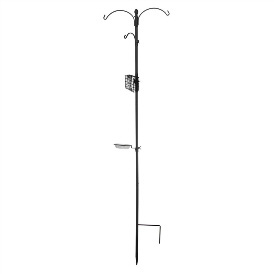 This metal bird feeder hanger is multi – purpose and can be used for feeders, plants, lanterns and lots of other stuff you want to hang. Its simple strong and rust resistant design can hold up to 35 pounds. It is safe to hang it on trees and balconies, and looks elegant. The simple design makes it easy to hang where ever you want. If you have a bird feeder, birdhouse or plants, just hook it on a next available tree branch. You can get your money back any time. That’s great to hear. 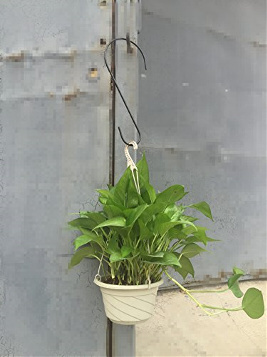 Check the price here Metal Tree Branch Hook, 12 or 23 Inch. This woodlink window glass bird feeders hangers are made of clear plastic, and convert normal seed or hummingbird feeders to window feeders. The hanger are made of strong clear plastic, and come with two suction cups. Holds up to a 4 lb filled feeder. It can be used for smaller feeders, or some other things like wind chimes. Clean the window before installing the hanger. Wait for the glass to dry, then stick the suction cups in place. You can wash the suction cups before in warm water for better grip. It is easy to use. The suction cups hold firm even if you hang a heavier bird feeders. One of the best things you can get for that price. Check the price here Window Glass Hangar for Bird Feeders.